The siting of an OTEC plant, either onshore or offshore, represents one of the key decision for any proposed project. The other key decision is the type of cycle to use. There are two principle options, an open cycle plant or a closed cycle plant. Hybrids of the two have also been proposed. A closed cycle OTEC plant employs a thermodynamic fluid such as ammonia or a refrigerant like freon. This is contained in a completely closed system including the plant turbine. Hot surface seawater is used to evaporate the fluid and the vapour is then exploited to drive the turbine. 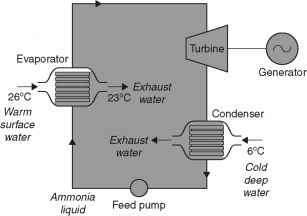 The vapour from the turbine exhaust is condensed using the cold, deep ocean water, and returned to the beginning of the cycle where it can be reheated. A 50 kW closed cycle OTEC plant was built in Hawaii in 1979 and operated for a few months. A consortium of Japanese companies has also operated a 100 kW closed cycle OTEC plant in Nauru. Again this plant operated for only a few months to prove the concept. Neither was large enough to be commercially viable. Indeed, closed cycle OTEC is unlikely to be commercially viable in sizes of less than 40 MW. In an open cycle OTEC system the seawater itself is used to provide the thermodynamic fluid. Warm seawater is expanded rapidly in a partially evacuated chamber where some of it 'flashes' to steam. This steam is then used to drive a steam turbine. From the exhaust of the turbine, the vapour is condensed using cold seawater. The vapour produced by flashing warm seawater is at a relatively low pressure so it requires a very large turbine to operate effectively. Practical limitations mean that the largest open cycle turbine that can be built today is around 2.5 MW, much smaller than for a closed cycle system. One of the major advantages of the open cycle system is that the water condensed from the turbine exhaust is fresh, not salt water, and so the plant can also serve as a source of drinking water as well as electricity. A 210 kW open cycle OTEC pilot plant operated in Hawaii between 1993 and 1998. In a hybrid OTEC plant warm seawater is flashed to produce steam and this steam is then employed as the heat source for a closed cycle system. This system is more complex that either of the other cycles but it marries the compact closed cycle system with the ability to produce drinking water. Is a turbine an open or closed system? 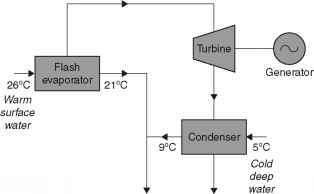 Is a thermal plant an open or closed system? What is open cycke OTEC? What is open cycle system in otec? What is open ocean thermal energy with diagram? What is closed ocean thermak energy with diagram? What is closed type of otec? Which type of turbine used in otec plant? What are types of otec? What is meant by OTEC open CYCLE? What is mean by closed cycle and hybrid cycle? What is closed cycle OTEC? What is opened cycle otec? What is the difference between open cycle and closed cycle otec system? What is open cycle system of ocean thermal energy conversion? What is open and closed cycle ocean thermal energy conversion? What is the difference in a closed or open ocean? What is differenc between open cycle and close cycle in ocean thermal energy conversion? Is the Kernt cycle a open or closed system? Which gas is generally used as a refrigerant in OTEC (Ocean Thermal Energy Conversion)?